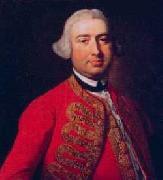 Thomas Hudson (1701 - 1779) was an English portrait painter in the 18th century. He was born in 1701 in the West Country of the United Kingdom. His exact birthplace is unknown. 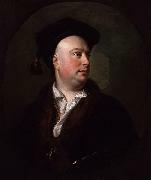 Hudson studied under Jonathan Richardson in London and against his wishes, married Richardson's daughter at some point before 1725. Hudson was most prolific between 1740 and 1760 and, from 1745 until 1755 was the most successful London portraitist. He lived at Deep Cross, Twickenham. Many assistants were employed by Hudson, to help with his paintings. Joshua Reynolds and Joseph Wright were students of Hudson. He retired toward the end of the 1750s.